J. Ajaka et al., 1998, New measurement of Sigma beam asymmetry for eta meson photoproduction on the proton, Published in Phys. Rev. Lett. 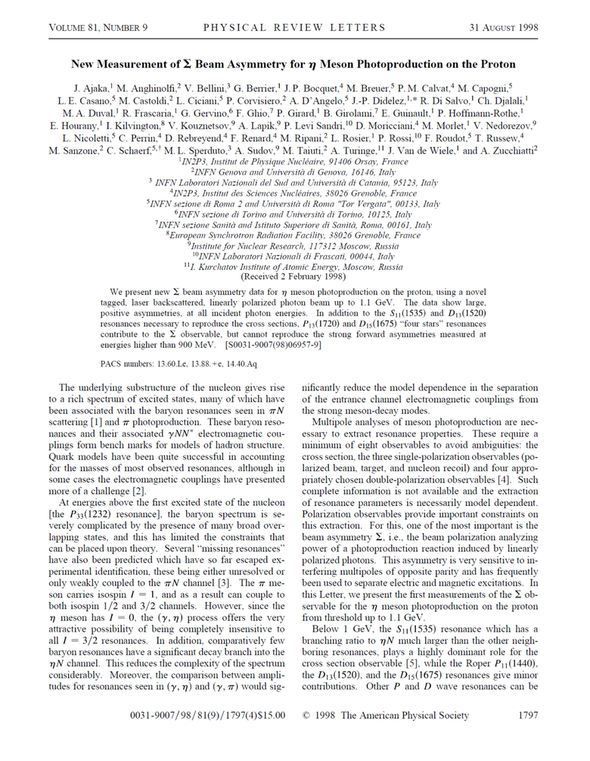 81 (1998) 1797-1800, DOI: 10.1103/PhysRevLett.81.1797, Cited by 224 articles. We present new Sigma beam asymmetry data for eta meson photoproduction on the proton, using a novel tagged, laser backscattered, linearly polarized photon beam up to 1.1 GeV. The data show large, positive asymmetries, at all incident photon energies. In addition to the S11(1535) and D13(1520) resonances necessary to reproduce the cross sections, P13(1720) and D15(1675) “four stars” resonances contribute to the Sigma observable, but cannot reproduce the strong forward asymmetries measured at energies higher than 900 MeV.